C. Vision's tour of railroads in and around the Chicagoland area continues in Windy City Rails, Volume 4. In this program, videographer Marshall Beecher takes his cameras to several locations along the Burlington Northern Santa Fe's Triple Track Main from Chicago to Aurora. This ex-Chicago Burlington and Quincy main line does double duty as it hosts trains traversing to and from the Twin Cities on the Aurora Sub and Galesburg on the Mendota Sub. Numerous high priority intermodal, coal and general freight trains share these rails with Amtrak and Metra. Run-through trains from the Canadian National and Union Pacific also operate on the Triple Track. At the east end near Union Avenue, witness several of Union Pacific's 'Z' trains which cross the Triple Track, and see U.P. movements with several of their Heritage locomotives! All this movement makes the Triple Track one of the busiest main lines in the Chicago area. 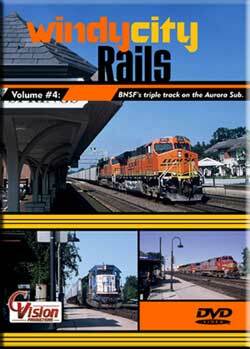 Just about every kind of locomotive that the BNSF rostered in 2007 can be seen in this program! Add in all that variety along with over 150 trains featured in this show and you have one of the best BNSF programs anywhere!!! This is a great video. Lots of fast moving trains on the Chicago line. Being a big fan of Chicago area I loved this DVD. C VISION has done it again! I still think Cvision dvd's are a bit pricey for under 2 hour dvd, but get this video, you'll love it. BNSF fans will want this for sure. Lot's of "pumpkins"
Marc B. (Itasca, IL) on 2011-01-21 13:32:56.